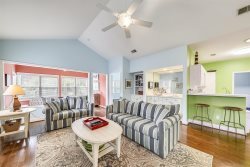 Welcome to a hidden jewel, Coligny Villas is located in Forest Beach and is a quick walk to Coligny Plaza and the beach. This is a 2 bedroom, 1.5 bath townhome perfect for a quick getaway from reality. As you enter the property you will be greeted by the foyer which leads to the main living area. The galley kitchen is fully equipped with cooking essentials if you prefer to dine-in. A dining room table with seating for 4 leads to the living room. The living room includes a flat screen 39" TV and a sleeper sofa. Sliding glass doors lead to the balcony. Off the living area is a convenient powder room. Both bedrooms are located upstairs. The master is located at the top of the stairs and has a king size bed and flat screen TV. A hall with a full size bath leads to the guest bedroom which includes two twin beds. This unit comes with parking and is pet friendly, although pets are NOT allowed in the courtyard area. Forest Beach stretches along the Atlantic Ocean between Shipyard and Sea Pines Plantations, just minutes from the beach. Bike paths on North and South Forest Beach eventually draw one to Coligny Plaza, the hub of the Forest Beach area. While competing with the natural beauty and lure of the beach, the plaza offers a variety of shopping, dining, and fun entertainment for the whole family. Great experience! Very friendly and understanding staff. We had our vacation house cancelled by a private owner and decided to call sunset rentals , the lady was very sweet and helpful! She made sure we recieved the best price and the best house for us. The stay was amazing! The property was clean , close to the beach and everything else! Very happy with our stay and would return again next year! We had a great experience working with the customer rep and that she was willing to work with us on arriving on Sunday and leaving on Sunday. Your team is all pleasant and so willing to answer questions and are so helpful!!! The property is well taken care of and is the condo! !